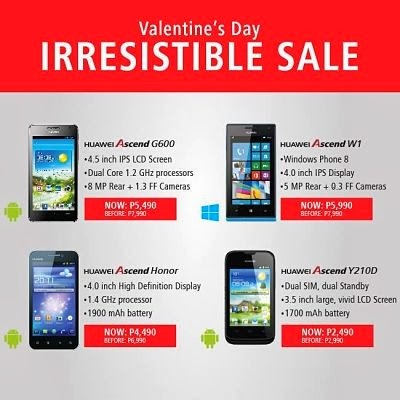 Huawei device celebrate Valentine ’s Day with these irresistibly amazing smartphone available on sale. Show your love to your significant other with this best in class Android and Windows Phone 8 handsets at very affordable price. Save up to 2500-5000 pesos free gifts on your favorite Huawei phone listed on this promo from February 7 to March 10, 2014. Announced on their Facebook page, a promo flyer with Jasmine Curtis Smith as their first ever brand ambassador in the Philippines. You can also join their HuaweiToUrHeart promo and get a chance to win a brand new Ascend G610 smarthphone as a sweet offerinf from their new endorser and the company. They will announce the the 3 winners this coming Valentine’s day. Meantime, here is the list of devices available on sale along with promo price and specs. Get this phone via Globe Postpaid Plan 499. You can also get this phone via Sun Postpaid Plan 350 Huawei Y210D. Visit your nearest Huawei authorized reseller and store nationwide to avail this Valentine's day sale. Note that this promo runs only in a period of time, price may change without notice and may go back to its original suggested retail price.